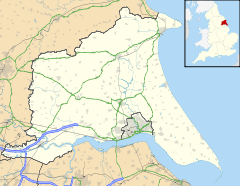 Market Weighton (/ˌmɑːrkɪt ˈwiːtən/ WEE-tən) is a small town and civil parish in the East Riding of Yorkshire, England. It is one of the main market towns in the East Yorkshire Wolds and lies midway between Hull and York, about 20 miles (32 km) from either one. According to the 2011 UK census, Market Weighton parish had a population of 6,429, an increase on the 2001 UK census figure of 5,212. The 19th-century English lexicographer Sir William Smith proposed Market Weighton as the location of the still-undiscovered Roman camp of Delgovicia. Historically the town was listed in the Domesday Book as "Wicstun" and was granted its charter to become a market town in 1251. Notable architecture includes: a parish church, parts of which are Norman, the Londesborough Arms (an 18th-century coaching inn), a Wesleyan chapel, a Methodist chapel and a high street still recognisable from the 19th century. Other sights of interest include the post office, the duck pond and Station Farm. Market Weighton history includes William Bradley, the Yorkshire Giant who at the age of 20 was 7 ft 9 in (2.36 m) tall. In May of each year local residents take to the streets of Market Weighton for the Giant Community Day (formerly Giant Bradley Day) festival in a celebration of the life and times of William Bradley. Industry in the town is largely based on agriculture. The town is known geologically for having given its name to the Market Weighton Axis. The Yorkshire Wolds Way National Trail, a long distance footpath, passes through the town. As a civil parish, Market Weighton has a town council, which operates under the East Riding of Yorkshire Council. In 2003, after some local consultation, the Weighton Area Regeneration Partnership (WARP) adopted a slogan and logo, 'The Heart of East Yorkshire', intended to indicate both its central location in the county and the strength of the local community. WARP was dissolved in 2012 but the phrase continued in use to promote the area and on local signage. Market Weighton has two churches. These are the All Saints Church, and the St John’s Methodist Church. The church dedicated to All Saints was designated a Grade I listed building in 1967 and is now recorded in the National Heritage List for England, maintained by Historic England. Market Weighton railway station was at the junction of the lines to Selby, Driffield, York and Beverley. The last train ran in 1965. The abandoned lines to Beverley, and to Selby are now used as public paths, as the Hudson Way and Bubwith Rail Trail respectively. Bus service X46, provided by East Yorkshire Motor Services, links the town with Beverley, Hull, Pocklington and York. The three-mile £5.1 million A1079 bypass opened in March 1991. The Minsters Rail Campaign is campaigning to re-open the railway line between Beverley and York (with stops at Stamford Bridge, Pocklington and Market Weighton). The re-opened railway would skirt the edge of the town as the former alignment has since been developed. ^ a b UK Census (2011). "Local Area Report – Market Weighton Parish (1170211222)". Nomis. Office for National Statistics. Retrieved 21 February 2018. ^ UK Census (2001). "Local Area Report – Market Weighton Parish (1543504265)". Nomis. Office for National Statistics. Retrieved 18 February 2019. ^ "BBC News Humber". Town Launches Own Logo. BBC News Online. Retrieved 22 November 2012. ^ Historic England. "Church of All Saints (1160460)". National Heritage List for England. Retrieved 11 August 2013. ^ "Market Weighton station location". Minsters Rail Campaign. Retrieved 6 February 2013. ^ "This Giant remains among friends" (PDF). The West In View. June 2006. p. 40. Archived from the original (PDF) on 29 September 2007. Retrieved 6 February 2013. ^ Beddoe, D. (23 September 2004). Foxley, Barbara (1860–1958), educationist and campaigner for women's rights. Oxford Dictionary of National Biography. Retrieved 29 January 2018. ^ "Frank Mitchell's obituary". Wisden Cricketers' Almanack. 1936. Retrieved 6 March 2010. Gazetteer — A–Z of Towns Villages and Hamlets. East Riding of Yorkshire Council. 2006. p. 8. Wikimedia Commons has media related to Market Weighton.